After giving you the tour of our first day in the Okanagan, it was high time to reappear with day two. Day two was our only full day in the area and we packed as much in as we could. 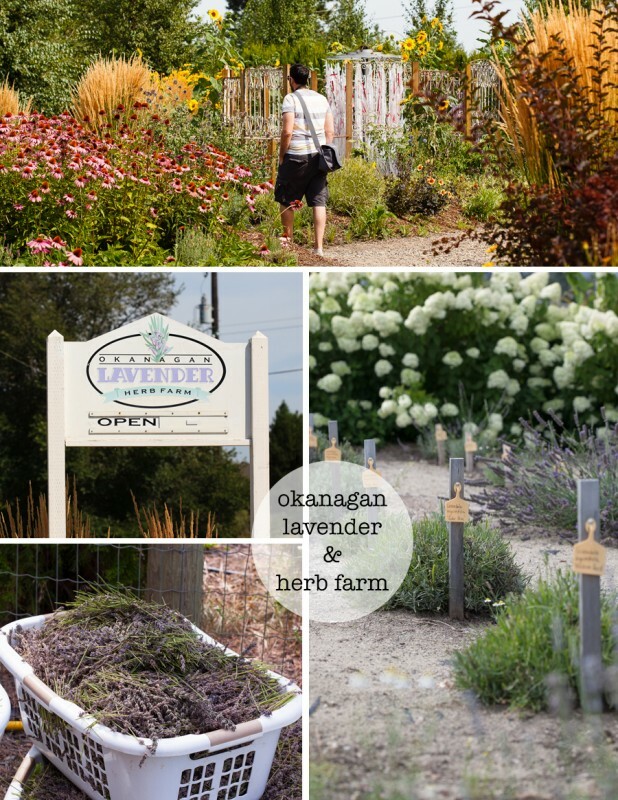 We started out the day at the Okanagan Lavender Herb farm. If you love lavender, then this is the place to be. The scent permeates everything! 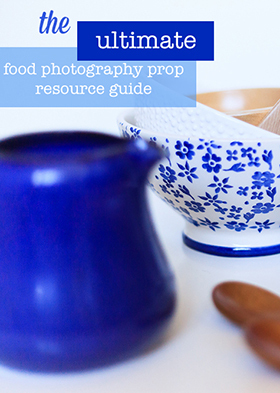 If you love taking photos, this is also the place to be – it’s a feast for the eyes. We decided to pay to take the self-guided tour of the farm and garden. The farm isn’t just lavender, although that is certainly everywhere, all purple and blowing softly in the breeze. We saw all kinds of echinacea, basil, mint and sunflowers. The gift shop sells all kinds of goodies from essential oils to bars of soap, skincare products and sachets of dried lavender. 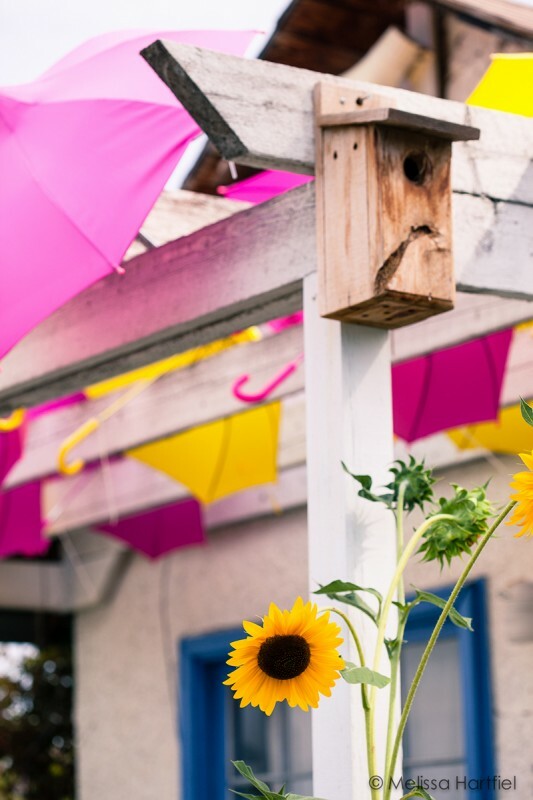 And I just dug these umbrellas and sunflowers… so I took a lot of photos of them! 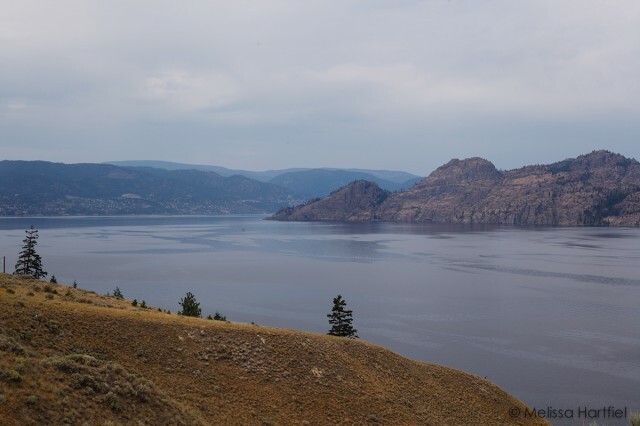 Next, we decided to head up to Summerland to experience the bottleneck drive – it’s a windy drive through the backroads of the area and it’s well worth the trip. The area is simply stunning with orchards, wineries, desert hills and the lake. The first photo in this post was taken from Thornhaven Winery – which I think had my favourite view of the entire trip. But first, on our way there, we stopped at a roadside fruit stand offering u-pick peaches and that’s where we met Max! 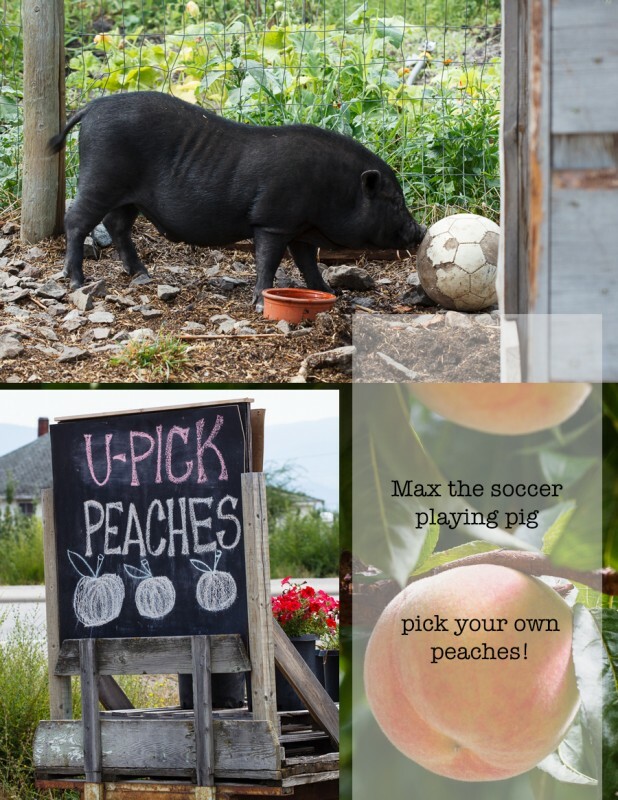 Max is a soccer playing pig who hangs out by the fruit stand. He also has a little tire swing that he hops in and out of! 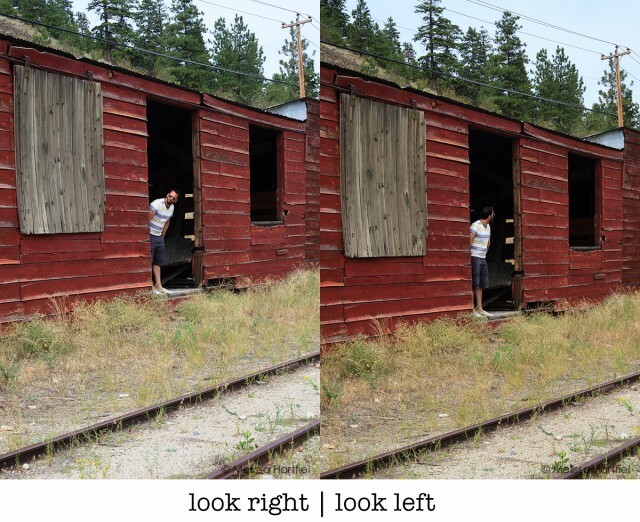 We puttered about taking photos inside and out (I’m saving mine for another little project I have happening) but we had a little fun goofing around with E waiting for the train… it never did show up. Our first stop on the bottleneck drive was Summerland Sweets and Sleeping Giant Fruit Winery. This place is… a gem. We spent a long time in here and a lot of money. 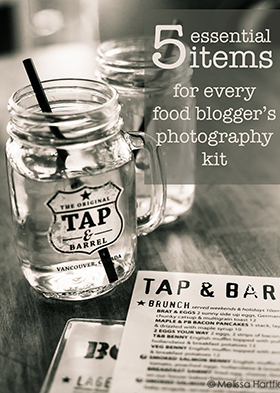 First of all… they have a tasting room… for syrup. A syrup tasting room people!! And there was nobody in it except for us! And we tasted ALLTHESYRUPS. There must have been at least a dozen. Peoples, if you go there, buy yourself a bottle of Apple Pie Syrup. 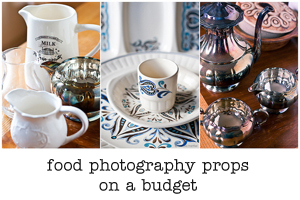 Trust me… it will be one of the best purchases of your life. I made a peach pie with it (recipe coming!) 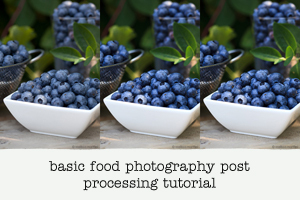 but I’ve also drizzled it all over frozen yogurt as well as countless other foodstuffs! It’s all apple-y and caramel-y and just… syrup-y goodness. Sigh. They also have jams and preserves in every flavour you can imagine (I succumbed to pear and rum jam), as well as ice cream and… and a seconds table with all kinds of goodies that got labeled wrong or had too much pulp in them and they are ridiculously cheap. I bought some dirt cheap apricot syrup that had labels that were crinkled. 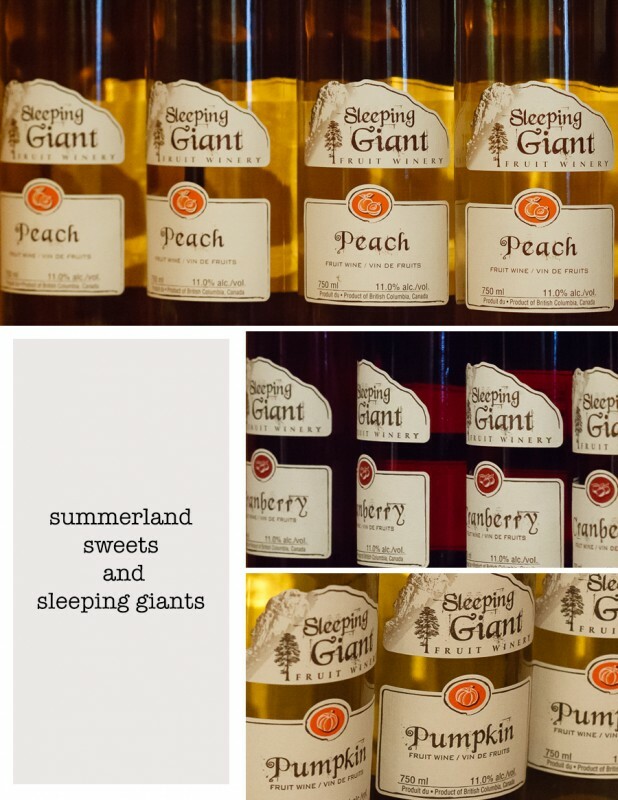 They are also home to Sleeping Giant Fruit Winery – a neat alternative to all the other wineries in the Okanagan. We did a tasting here and were really quite impressed. I’m sipping a glass of their peach wine as I type this but I also bought a bottle of strawberry rhubarb wine and, yes, pumpkin wine, which I completely fell in love with after tasting it (I was so curious!). The lady pouring our tasting said it’s also excellent warmed up as a mulled wine and with the spicing, I think she’s probably right! 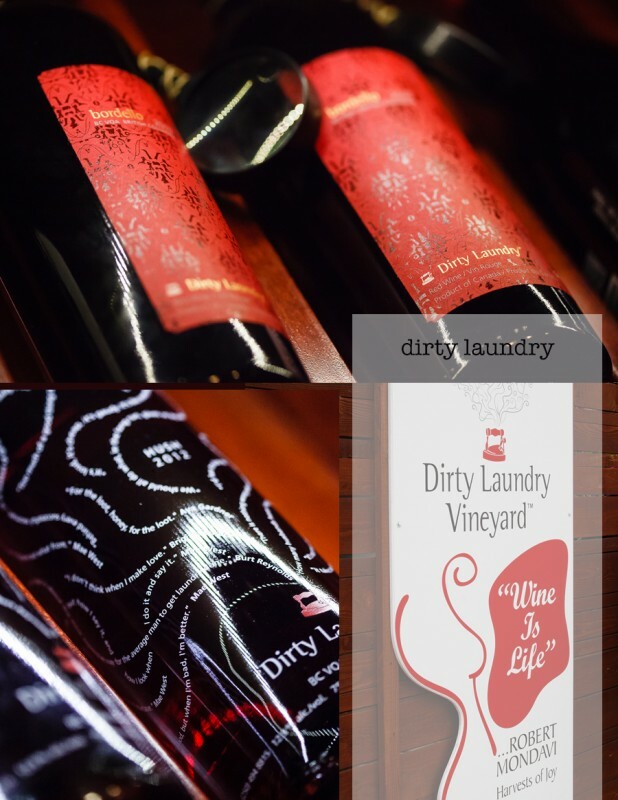 Next up was Dirty Laundry Vineyard. This is a saucy little winery steeped in local history. The name comes from a laundry that operated in the region in the early 1900’s but actually was home to a brothel. The theme runs through everything the winery does, from their simply stunning packaging (makes a graphic designer sooo happy!) to their staff outfits. This is a very fun stop with some nice red wines. After this we headed to Thornhaven Winery for another tasting, which given my very empty stomach and my lightweight stance with alcohol, I was cut off from! Ethan enjoyed it though. 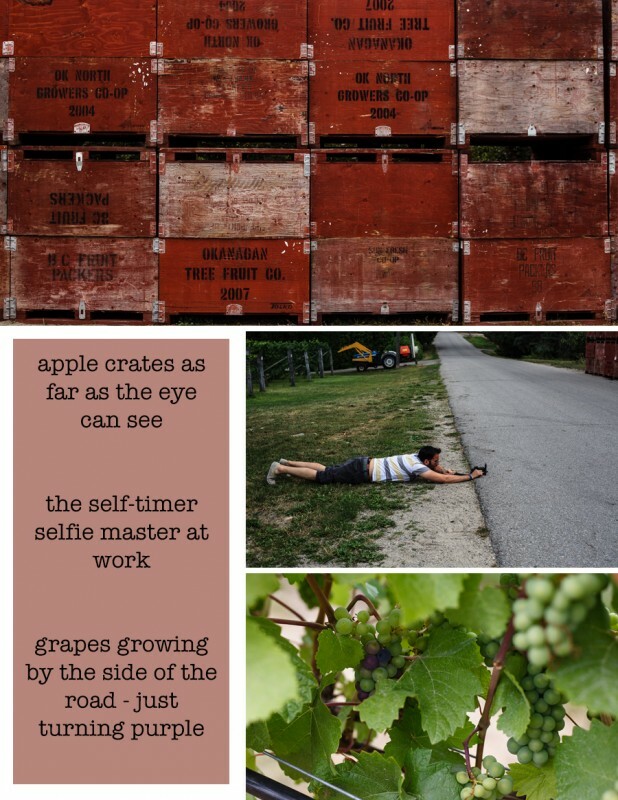 Just down the hill from the vineyard we stopped by the side of the road next to an apple orchard with stacks of apple crates piled up high. More photo hijinks ensued, including Ethan spending an inordinate amount of time setting up an iPhone self-timer shot (it wasn’t that long but… I was HUNGRY!!). As soon as he ran across the road to get in the shot, a car came along – and as luck would have it… Ethan got his shot! The car passed literally a fraction of a second after the shutter went. When I travel I’m generally pretty agreeable. Unless I’m tired or… hungry. And by this time I was hungry. Very hungry. 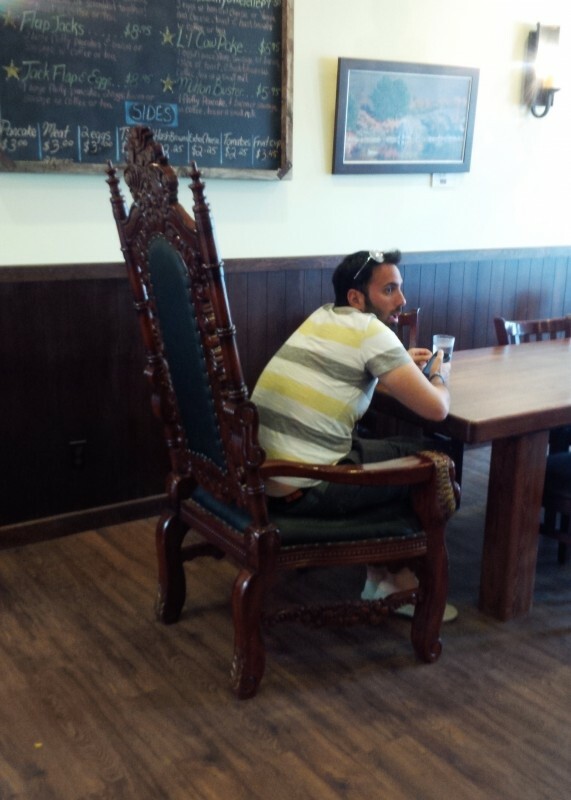 So we stopped in Summerland at a cute little cafe that was getting ready to close as we walked in. Apparently, everything in Summerland closes at 4pm! But they obliged us with some salad and spanokopita and… Ethan got to sit in a really big chair at a realllllly long table. So it all worked out! 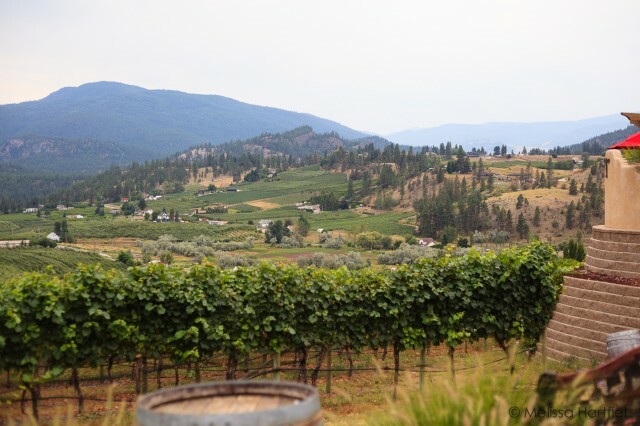 We carried on and stopped at the Greata Ranch Estate Winery on our way back to Kelowna for another tasting (I was once again allowed to partake…). They also had some pretty stunning views of the lake! Our next stop was another fruit stand where I shot this photo right before getting bitten or stung by a wasp or bee. Sadness. But Ethan had just bought a fresh baked butter tart from them and he gave me a bite so… it was all ok.
Next up was figuring out some dinner. At the prompting of Laura and her girls, we decided to head to downtown Kelowna for dinner at Bai Tong. The girls insisted before we left to eat, that we get the pad thai because it was… the best. Like… OMG… the BEST. This was reinforced several times by the youngest one so… we had to try it! It was pretty solid Thai Food – add a little lakeside evening stroll and it was a good end to the a good day! 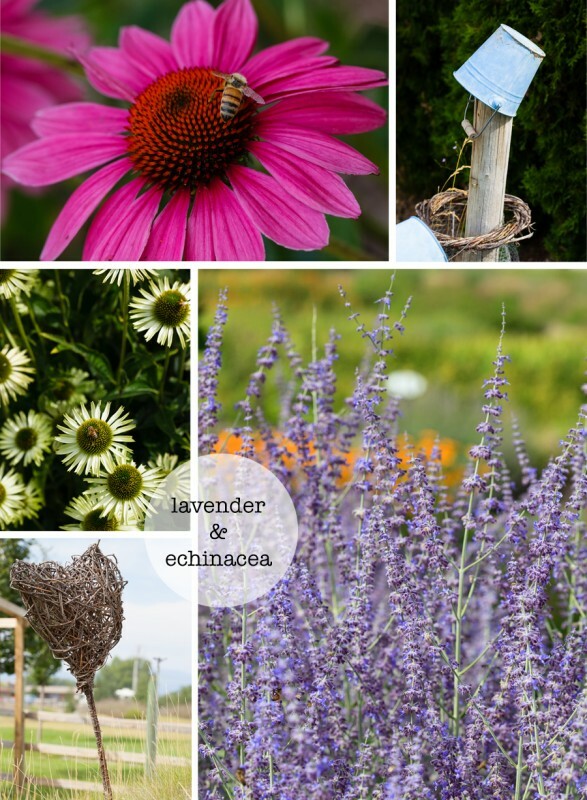 Your photos at the Lavender Herb Farm are vivid and beautiful. I love the one with the bucket on the fence post. I can imagine how intoxicating the scents were there. Max must have been such a treat to watch, not to mention Ethan during your outing. It looks like it was certainly a very full and very enjoyable day. Thanks for sharing your trek on this food and wine journey with us. 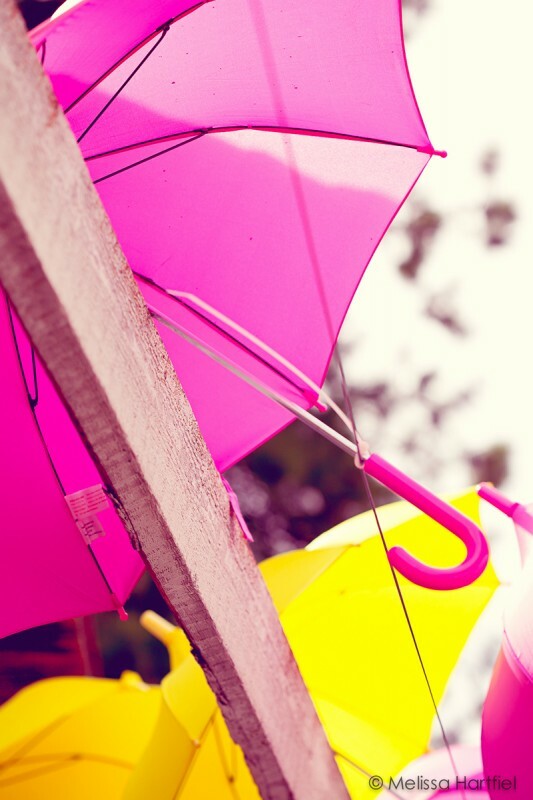 Awesome posts Melissa! I loved our trip up to that way this summer too. Always wish I could spend more time, but we seem to be passing through from somewhere or another. We also met MAX! Bought some yummy fruit and homemade granola bars there.